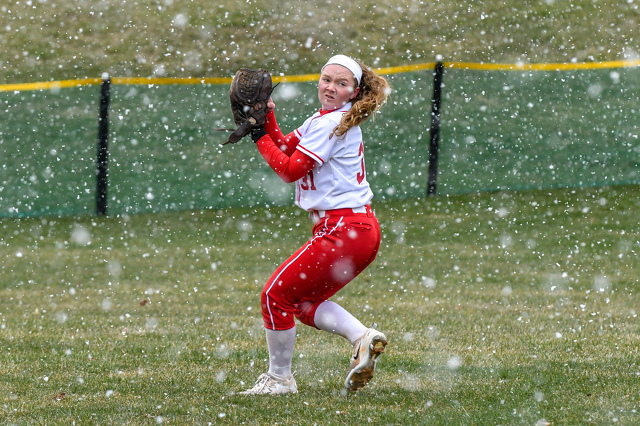 Lady Red Raider Alexis Wetzler (31) looks through the snowflakes as she returns the softball to the infield during Bellefonte’s recent weather-invaded contest against Tyrone. Bellefonte defeated the Lady Gold Eagles, 15-6, on April 9. The weather has certainly not been cooperating, but local high school softball teams are nonetheless getting in some important early-season games. So far, after a ton of postponements due to everything from snow and ice to muddy field conditions, Bellefonte stands at 3-1, BEA at 2-0, P-O at 2-0, Penns Valley at 1-2 and State College is 1-1. Bellefonte began the season on fire with a 7-2 win over Huntingdon and then a six-inning, 14-4 romp against DuBois on March 28. The beginning of April was not as kind, however, as the Lady Raiders started the month with a 9-4 loss at Philipsburg-Osceola on April 6. In that game, the Mounties jumped out to a 7-3 lead after two innings and then really put on the pressure with two more in the third to go ahead 9-3. Bellefonte added a run in the sixth, but P-O held on for the 9-4 win in its first game of the year. Kam Harris pitched a complete game for the Mounties and also helped herself out with a home run and two RBIs. Kylie Adams had three hits for P-O and Hannah Thompson had two while Adams and Rachel Simpson combined for five RBIs. Bellefonte didn’t let the loss get it down, however, as the team turned right around and routed Tyrone, 15-6, at home April 9. Bellefonte was behind by a run, 4-3, going into the bottom of the fourth inning and then rallied for four runs in that inning, four in the fifth and, finally, five more in the sixth to sail away with the win. Taylor Kerr led Bellefonte with three hits, including a home run, and three RBIs while Alexis Wetzler also added three hits for the Raiders. Next up for Bellefonte will be a Mountain League home game Thursday, April 12, against Central. Bald Eagle Area is off to a strong start as well. The Lady Bald Eagles are 2-0 after Zoey Surovec notched her second win of the season with a complete-game, 7-2 win over Huntingdon on April 6. Surovec had help from Mara Caldana who slammed two doubles and drove in four runs in the game. BEA will next take on league foe Central at home. The State College Little Lions have gotten on the field just twice so far and fell to Mid Penn rival Central Dauphin 6-5 on April 6 in their first game. CD’s Nichole Bechtel hit a two-run, walk-off homer to give the Lady Rams the win, spoiling SC's opener. Ashley Blumenthal had three hits for the Lions and Sarah Bowman chipped in with three RBIs. The Lady Lions rebounded nicely, though, with a 17-1, four-inning romp over Red Land on April 7. State College put up 10 runs in the second inning and then cruised out from there for its first win of the season. Morgan Arnold and Brandi Triebold had three hits each for SC, while four other Lions chipped in with two hits apiece. In Spring Mills, Penns Valley is in the middle of a tough five-game road trip to begin the season. After the 4-0 loss to BEA, the Lady Rams came back to take a 5-4 Mountain League win at Central on April 6 to even their record at 1-1. The next day, however, at Mifflinburg, PV managed just four hits and took a 6-3 non-league loss. Ryleigh Cain had two hits and an RBI for the Rams, but her efforts weren’t enough to hold off Mifflinburg. Next up for the Rams will be a league game at Clearfield on Thursday, April 12, and then a big showdown against Philipsburg-Osceola on Friday, April 13. Games to watch include Bellefonte at BEA on Tuesday, April 17, P-O at Penns Valley on Friday, April 13, and Carlisle at State College on Thursday, April 12.